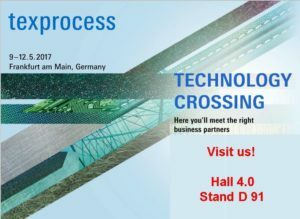 From 9 – 12 May 2017 you will be able to meet us at the biggest fair of manufacturers of machinery and equipment for the textile industry Texprocess in Frankfurt. This is another edition in which key producers from around the world will present visitors the latest technological solutions in the field of machinery and equipment for the textile industry, CAD / CAM systems and the preparation and production control in the garment industry. The fair is an opportunity to meet with representatives of the industry, manufacturers of paper, foil, cutting room equipment, an opportunity to enter new markets and attract many customers and business contacts. ← (Polski) Do zbiorów DULEDO dołączyło kolejne wyróżnienie – Gazela Biznesu 2015.